With AACoder Plus users can batch convert music between 5 major audio formats. Product supports AAC Mp4 file type - probable inheritor of Mp3 due to its crisp, lossless CD audio quality, smaller file size and very fast encoding. AAC is supported by major hardware and software products like iPod and iTunes. Software performs fast automated conversions due to lack of intermediary files. Supported formats are: Wave, Mp3, Mp4 (AAC), WMA, Ogg Vorbis. ...... AAC Mp4 audio format is supported by major hardware and software products like iPod and iTunes. AACoder Plus is very easy to use. Just add the files you want to convert to the list, conveniently listen audio preview of the selected file, select the format you want to use, and then click the convert button. You can easily convert your existing music by adding whole folders and sub folders containing audio files to conversion list. High converting speed and batch conversions result in a simple and boredom-free process. Besides all this, AACoder Plus can even automatically shut down your computer, so you can leave it running while you go out or go to bed! Software performs fast automated conversions due to its advanced encoding technology and lack of intermediary files. 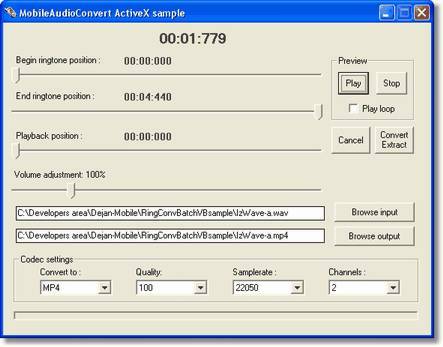 Batch converts your music between 5 major audio formats, including AAC Mp4 audio. Qweas is providing links to AACoder Plus Free 1.6 as a courtesy, and makes no representations regarding AACoder Plus Free or any other applications or any information related thereto. Any questions, complaints or claims regarding this application AACoder Plus Free 1.6 must be directed to the appropriate software vendor. You may click the publisher link of AACoder Plus Free on the top of this page to get more details about the vendor.